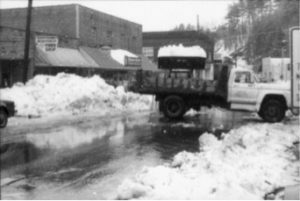 Workers for the town of Spruce Pine with dump trucks and a loader attempt to clear record amounts of snow from Oak Avenue in March of 1993. 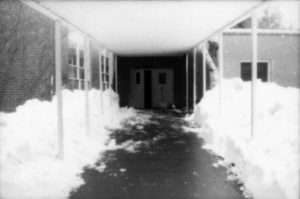 On March 12, 1993 snow began falling on a Friday afternoon. By Monday, March 15th, the Storm of the Century had dumped upwards of between 3 and 5 feet of snow on the region. The storm formed in the Gulf of Mexico and at its height, the storm stretched from Honduras to Canada and killed over 300 people. Measuring the amount of snow in Mitchell County was difficult because of hurricane force winds. As if the heavy snow wasn’t enough, temperatures bottomed out below zero and wind chills were in deeply negative figures. The storm paralyzed travel in the mountains, causing widespread power outages and bringing to an end hopes for an early spring. Schools in Mitchell County were cancelled for over a week. This image illustrates the depth of the snowfall at the entrance to Deyton Primary School.